Patients should be "decanted" to other hospitals in the event of another bed-blocking crisis at the Royal Cornwall Hospital, a councillor has said. A "black incident" meant 43 elective operations were cancelled in two weeks. Trust chief executive Lezli Boswell told an extraordinary meeting of Cornwall Council's Health Scrutiny Committee she was "deeply sorry". Health commissioners tabled 17 recommendations including more training and improved communication. Between 30 September and 6 October, 26 elective operations were cancelled, then a further 17 procedures were cancelled on 7 October. In some cases, the procedures were cancelled after patients had changed into gowns and received pre-treatment medication. The RCHT said it needed 20 discharges a day to function properly. The situation on 7 October resulted in the trust declaring a black incident, the highest level of crisis. The Health and Social Care Scrutiny Committee, at County Hall in Truro, heard bed-blocking had occurred because of an unusual number of admissions. 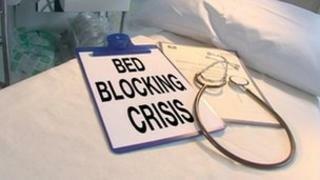 Councillors said other beds in Devon or Cornwall should be employed to help alleviate the situation. Conservative councillor Sue Nicholas told the BBC: "I think we should look at how we utilise beds in other hospitals, whether they are empty or mothballed. "When we get to the state of a black alert, we should be able to decant people - although that's a horrible word - and utilise whatever beds are available at that particular point in time." NHS Kernow, the local clinical commissioning group, told the meeting that improvements to staff training and better access to information were key issues. It said 17 new draft recommendations had been created to prevent another such crisis. The measures included getting agencies to talker earlier after an incident arose, the meeting heard.